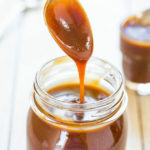 Created during The African Table Tanzania, this is literally the easiest most delicious dessert sauce! Perfect with mandazi, crepes, pancakes.... or anything, really! Feel free to omit the Scotch/Whiskey. If you don't have chai masala spices, use cardamom or cloves or cinnamon. In a small sauce pan under medium-high heat, add coconut milk and cane sugar. Stir with wooden spoon patiently until thickened. If mixture bubbles up lower heat slightly and continue mixing. Continue stirring until thickened and brown in color. Add whisky/scotch and continue mixing for additional minute. Finally add masala chai spices and butter. (You may add a pinch of salt for a little toffee like flavor.) Mix until mixture is thickened and smooth. It should coat the back of a spoon. Let cool and use on dessert of choice! Can also be jarred for future use. Enjoy!